The packaging got me. It practically jumped off the shelf and said “you need me, right now”. 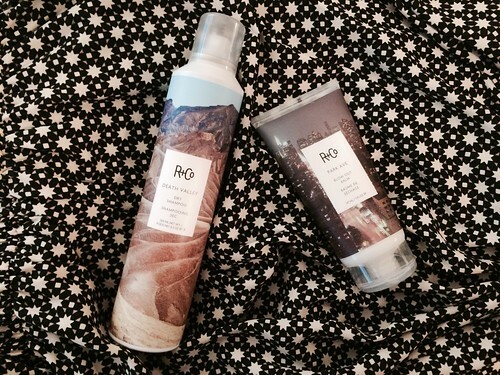 Ever since I added a little R + Co to my morning routine, my hair and bathroom have become so much…cooler. I’ll start with the dry shampoo, so dry it’s actually Death Valley Dry Shampoo. Two fold satisfaction with this product. 1) The tribute to death valley on the container (or, the packaging that demanded attention) and 2) the dry shampoo itself. This dry-shamp as opposed to others didn’t leave white residue in my hair. Even after wrestling my fingers around a bit, sometimes dry shampoo resins sneak back to my roots. Which is unacceptable. Death Valley leaves no residue, but still diminishes oil and gives flat hair a little umph. The Park Ave Blow Out Balm (New York on my product, yes) came to my assistance this morning. In the midst of a rain storm, I needed to blow dry my hair. After rubbing the balm through my perhaps-too-long locks and proceeding to blow dry, I made it to work with minimal frizz. Note, I also rubbed the balm in my hands and over my hair after it was dry. It is easy to see why this line is a favorite among-st hair stylists and salons. The products are incredible quality, and the packaging. I mean. Have you seen anything like it?